Dear Mr. President, I’m Writing You Because Nuclear Winter or Peace with Russia Is Your Only Choice. Extermination or Exaltation? 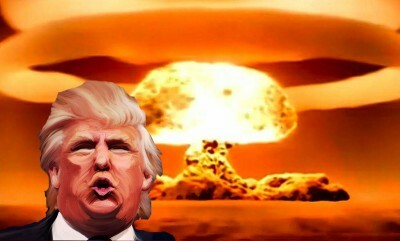 - George Bush Jr Started the New Arms Race and Nuclear Cold War with Russia - Donald Trump Can Stop It! The Russian Brass has patiently and ceaselessly argued since almost the inception of the modern Russian state that the United States and NATO missile shield elements, when used in conjunction with a surprise nuclear attack to mop up whatever surviving retaliatory nuclear missiles are launched from Russian territory, have shattered the tenuous peace M.A.D. affords us and has restarted the cold war down an even darker and more dangerous path for all of humanity, future and present. This military adventure and scrapping of ballistic missile treaties long past the planning stages as of Bush Jr’s helm suggests reducing Russian territory and cityscapes to infernos of radioactive rubble, and receiving limited but acceptable reprisal attacks, thus in there minds at least shattering the concept of Mutually Assured Destruction. Some of them believe they can win a Nuclear war, or they must because they have it embedded now in military doctrine including in academies and the battlefield in numerous drills. Subservient media peddles the war propaganda for the times. I don’t need to watch CNN or likewise to know we are being lied to, but it becomes painfully obvious when people do, no doubt. US military planners actually believe that they can for decades embargo countries, openly plan for their nuclear destruction, and strangle and encircle them militarily while running threatening drills and developing and fielding so-called defensive weapons on Russia’s doorstep without them upping the anty as they have been forced to, fielding deadlier and more evasive nuclear delivery systems. Remember, as scary as MSNBC or CNN or whatever criminal syndicate is ranting about how provocative and dangerous Russia is in announcing all these deadly countermeasures, just tell your people that these are bald faced lies and Russia was forced into this position, into having to project power, having to show its hand, and that indeed its these Russian offensive measures that are keeping us hopefully within the realm of a non starter as far as starting a Nuclear war with Russia goes. The balance of Mutually Assured Destruction is back in full force and its up to the US administration and Military to accept that and abandon there Skitzafrenic plans for defeating Russia militarily. Here is my letter to the President. The only way to end human suffering is to make peace with Russia now while we can, and end all the wars and talk of Armageddon; it is all avoidable and unnecessary. If you are serious about draining the swamp then please get on with it, at least purge PNAC signatories, my god, and if they say your appeasing Russia by making peace and restarting scrapped missile treaties that will keep us safe from being vaporized by nuclear retaliatory strikes from Russia, then so be it, they may thank you later when they realize they actually put our entire civilization and human existence into question. Every day you wait is another day closer to it being too late. Are you willing to do that Mr President, are you willing to take that sword off every man, women, and child’s neck. I would appreciate it for all of my people to not live on the edge of absolute ruin and despair with a knife to our throats every waking hour when all the avenues for peace leading to Russia are still wide open. More US Nuclear weapons and space laser weaponry does not make peace, it just furthers the agenda of beating Russia militarily. Please let peace and human life and environmental protection be the real objective. Blitzkrieg media propaganda fomenting lies and hatred and turning innocent civilians into pawns in the hands of these monsters holding the purse-strings doesn’t help, but it doesn’t stop you from making the call. Here’s a suggestion for some quick first steps towards peaceful resolution, from the layman; now I’m sure there are other avenues, but please, do something. Purge a few notable warhawks, set a date for talks with Russia on restarting all our failed missile reduction and disarmament treaties, within a matter of days you could probably have a formal signed non aggression pact with Russia, and inform NATO commands that Russia will no longer be referred to as an adversary. This is what Russia wants and presumably still holds onto hope, that America would begin to see her as a partner and not an adversary as madam Clinton had assured them during Obama’s reign of terror. There is much to save, and much to rebuild, much to undo, and a century of war to leave in the past as we seek a new and more everlasting future for all of humanity. A huge step is nuclear disarmament talks, mainly to reduce immediate tensions and arms race with Russia, but all interested countries are welcome to attend and many including DPRK would sign on to disarmament, the end goal and result being Nuclear weapons and the threat of there use can be eliminated from Human Civilization completely on your watch. That process could at least start, and must start immediately because there is an increasing risk of Nuclear war with talk of so called limited nuclear war that would likely spiral into more strikes and reprisals. With even just one so called mini-nuke spelling the end of life as we know it by some estimates its just unthinkable that you would sit on your hands. Having promised the world you had answered the call for peace when we are deploying these nuclear weapons into the field under your watch present day with firing permissions going to field commanders; rectifying this threat demands immediate action. You simply must wake up if you think that this is not the greatest threat humanity has ever faced. I apologize if as many assume that you know all of these things and much much more and you are working on it, for peace, however like you, I’ve been lied to all of my life and I don’t see all those promises you made before you got elected coming true. Please rout out this evil and this entire notion of nuclear arms making us safer or being forward deployed on hair triggers is not criminal treason putting all of humanity under the threat of annihilation. Why do you think the media is rabidly accusing Russia of meddling, they’ve even got notables like Tarpley convinced that Russia is acting aggressively and has actually meddled in our politics, its absurd: the USA has entire agencies whose sole purpose is meddling in other countries elections, including Russia’s!! The point is they risk being outed by the sheer audacity of it however they are so terrified that if they let you talk to the Russians there will be world peace the very next day. Make the call for peace Mr President, No matter that if on the other end there is a phone ringing on a Kremlin desk. If you recall – Your choice On the Brink of Nuclear Annihilation was between a Multi-polar World or Nuclear Winter – This holds damn true, and you must choose peace decisively. This article was originally published on blogdog.